An inguinal hernia occurs when a part of the intestine, or soft tissue, protrudes through a tear or weak point in the lower abdominal wall. The bulge that results can be quite painful, particularly when patients bend over, cough, or lift heavy objects. This type of hernia can have life-threatening complications, but they aren’t necessarily dangerous in themselves. Surgery is the most common form of treatment and patients who are being treated with this method should be aware of the possible complications of inguinal hernia surgery. Not all inguinal hernias will cause symptoms and won’t be discovered until a doctor discovers it when a patient is having a routine medical examination. However, a bulge can often been felt and seen. This bulge is often more noticeable when the patient is standing upright, particularly when straining or coughing. When symptoms are present they can include a bulge present on the right or left side of the pubic bone, a dragging or heavy sensation in the groin, and discomfort or pain in the groin (particularly when coughing, bending over, or lifting). Men may experience scrotum pain and swelling around the testicles (if the intestine protrusion goes down into the scrotum). In some cases there is no apparent cause. This type of hernia can occur due to an increase in pressure in the abdomen, having a pre-exising weak area in the wall of the abdomen, or a combination of both. This hernia occurs more often in men. Extra pressure in the abdomen can result in hernia regardless of whether there is a pre-exising abdominal weakness. Some causes of pressure include straining during urination or bowel movements, excess weight, heavy lifting, pregnancy, fluid in the abdomen, and chronic sneezing and coughing. Watchful waiting may be suggested if the patient is not experiencing symptoms or if their hernia is small. When the hernia is large or is causing symptoms, surgery is most often done to help repair the hernia and alleviate the symptoms. 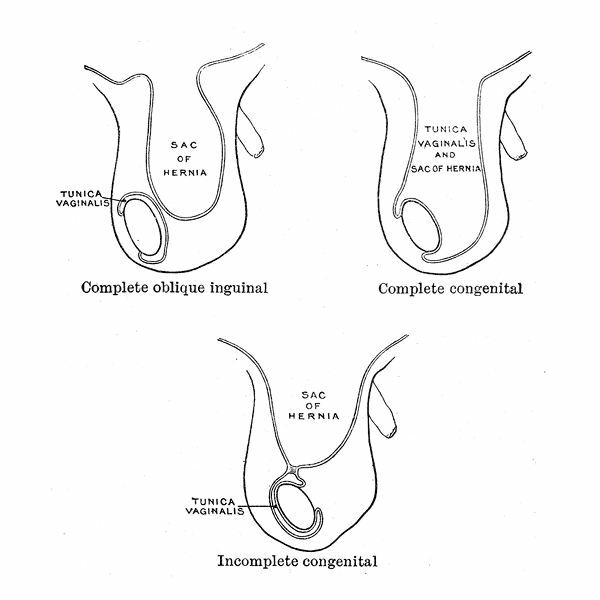 The types of inguinal hernia surgery performed include herniorrhaphy and hernioplasty. Complications of inguinal hernia surgery are relatively uncommon and the surgical procedures used are considered relatively safe. There is a chance that the patient will adversely react to the anesthesia used. Anesthesiologists take several precautions to prevent anesthesia risks, but they can still occur. Common anesthesia complications include urinary retention, headache, nausea, vomiting, and sore throat. The serious complications include heart attack, pneumonia, stroke, and blood clots in the legs. Patients may experience a hernia recurrence. This is the most common complication and it often results in the patient needing another inguinal hernia repair surgery. Less than two percent of patients can experience a wound infection. This complication is more common with complex hernia repair. If an infection occurs the patient may experience discharge from the incision, swelling around the incision, fever, tenderness around the incision, and redness around the incision. Antibiotics are needed to heal the infection, and sometimes an additional procedure to open the incision and drain the infection. Less than two percent of patients may experience bleeding inside the incision. A bluish discoloration and severe swelling can affect the skin around the incision. In some cases, the bleeding can only be stopped through surgery. Some patients may experience a tingling, sharp pain in a particular area near the incision after healing. In most cases, this pain will go away with time. If it continues, some patients may benefit from injections in the painful area. In extremely rare cases, the intestine, kidneys, blood vessels going to the legs, vas deferens, bladder, nerves, and internal female organs may become injured during this surgery. If this complication occurs, further surgery may be required.